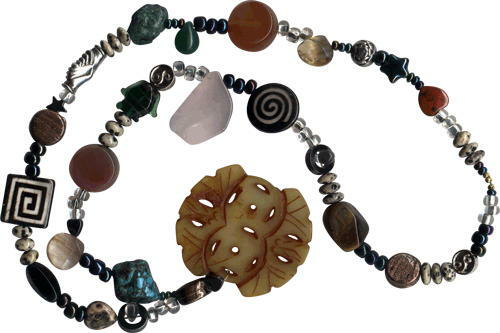 These "Beads of Grace" are about loving and nurturing your inner self. They may be worn as a necklace (26" loop) or utilized as a "Rosary". Please note: As Beads of Grace are a custom, hand-crafted item, they may vary slightly in beads and appearance. As you begin your spiritual practice by resting the beads in your lap, place the large center disc between both palms as you rest within, knowing and accepting inner calm. As you start your spiritual navigation from bead to bead, focus on each symbol and sas you begin your prayer. "When you pray, you stir into action an atomic force that releases a potent spiritual vibration of good that can be released in no other way." Regardless of outer appearances, conditions, or restrictions, there is always a place of greater light, security and warmth, a "go to" place within you. 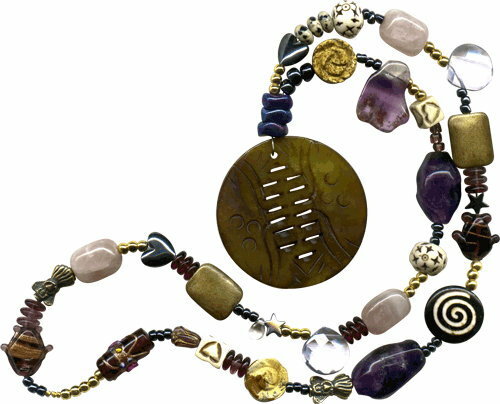 The symbols are “reminders “ to think happy, uplifting thoughts which create a natural overall good feeling. The fish with gold accents, represent a generous abundance of good and a circulation of wealth. The hearts stimulate unconditional love. The five points of the star guide us to invest in our life with prayer, meditation, study, service and circulation. Crystals provide for clarity of of thought and promote sound decisions. Roses open the door to love and friendship. Amethyst encourages healing, love, inspiration, and inner peace. All items in threes convey health, wealth, and happiness. The symbols are “reminders “ to think happy, uplifting thoughts which create a natural overall good feeling. The fish with gold accents, represent a generous abundance of good and a circulation of wealth. The hearts stimulate unconditional love. The five points of the star guide us to invest in our life with prayer, meditation, study, service and circulation. Crystals provide for clarity of of thought and promote sound decisions. Roses open the door to love and friendship. Turquoise strengthens the entire body and enhances creative expression. Tiger eye balances emotions and carnelian facilitates concentration. Dalmatian stones denote honor and integrity. The round gold dust beads remind us there is unlimited supply of good in our life. All items in threes convey health, wealth and happiness.